The festive period always makes me think about Christmases past: whether this is just my inability to move past my own past or whether this is something all people do, I am unsure, but I’ve spent a lot of time considering gifts that I had received in my youth. Of course, I feel terrible for focussing on the things that have been bought for me at this time of year rather than Pleasant Family Gatherings™, but the capitalist element of Christmas is probably the one that has had the biggest effect on me historially given the effect it had on the mood of my struggling single mother. Once, I was bought a book of card games, a book which provided the rules of scenarios of play for a number of games to be played with a traditional pack of playing cards. While these were subdivided by numbers of players, it seemed an odd gift to give to a child who didn’t often spend time with other children because his schoolfriends lived in a different town when travel was prohibitively expensive and whose mother had the same jaded, listless aversion to play that he would inherit. I got very good at several variants of solitaire. 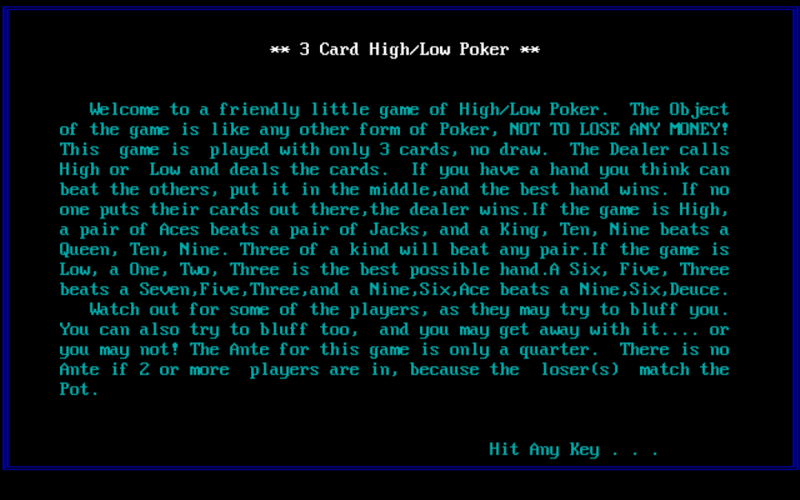 3 Card High-Low Poker reminds me of this because it is playing cards by yourself, just with the roles of other players who you may have played yourself (with some sort of perverse subconscious bias towards one ‘seat’ at the table) automated and rules effectively enforced. If nothing else, it’s made me realise that rule enforcement isn’t particularly fun in the solo-context, and it’s deviation from the rules to serve the aims of my ‘chosen’ seat that I enjoyed most when playing these multiplayer card games on my own; it was engineering my way around restrictions that I enjoyed. Given I now work in IT software and infrastructure architecture, I think this tendency towards trying to break things has served me well in life. The AI in this game is more than likely a cheater, I think. Far too often, only one non-player will declare themselves ‘in’ – a move that smacks of the most insidious of cartelisation and collusion against the player character. You never get this sense of othering when you’re playing cards on your own, I can tell you that for certain. While the game is simple, calling for only a key-lettered input to play, the game is perfectly functional and even enjoyable for a light logic game, working out whether the cards that you have been dealt are worth anything at all. Given that this is how most of my life is spent, it’s always worth getting a little more practice in.